Kansas City, Mo. — The newest division in Invicta FC has a fresh face. 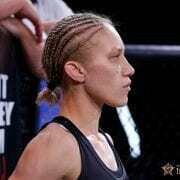 Joining the promotion’s lightweight division will be 24-year-old Felicia Spencer. The Canada-born, Florida-raised fighter earned a contract with the promotion after winning the Tuff-N-Uff “Future Stars of MMA” tournament on Jan. 9. Spencer, known as “Fee-Nom,” claimed the tournament with two finishes. She submitted Leanne Foster in the opening bout, before earning a TKO over Jessica Richer in the final. The wins moved Spencer’s amateur record to 5-1, with five straight victories. She will make her professional debut inside the Invicta cage in 2015. Invicta Fighting Championships is a world championship, all-pro mixed martial arts (MMA) fight series dedicated to providing female athletes with a major platform to hone their skills on a consistent basis. Founded in 2012 by longtime MMA executive Shannon Knapp, Invicta is committed to pioneering the future growth of women’s MMA by promoting the best possible match-ups between female competitors and identifying and developing future superstars of the sport. For more information, visit InvictaFC.com, follow Invicta on Twitter (@InvictaFights) and like Invicta on Facebook (Facebook.com/InvictaFights).